JOSEPH V. ARNO vs. COMMONWEALTH. Harbors. Real Property, Harbors, Littoral property, Registered land, License. Land Court, Registration proceedings. Trust, Public trust. Practice, Civil, Transfer of action to Superior Court, Consolidation of actions, Appeal. CIVIL ACTION commenced in the Land Court Department on August 12, 2002. Entry of partial summary judgment was ordered by Gordon H. Piper, J.; after transfer to the Superior Court, entry of summary judgment on the remaining issue was ordered by him, sitting under statutory authority. Seth Schofield, Assistant Attorney General, for the Commonwealth. Gordon M. Orloff (Gareth I. Orsmond with him) for the plaintiff. Diane C. Tillotson & Paula M. Devereaux, for Real Estate Bar Association for Massachusetts & another, amici curiae, submitted a brief. CORDY, J. This case requires us to consider the interplay between the system of land registration, G. L. c. 185, §§ 26-56 (Registration Act), and the public trust doctrine. In particular, we confront for the first time whether the registration of a parcel of land may extinguish the public's otherwise existing rights therein. We conclude that it cannot. theory that the Commonwealth's and the public's rights in the property -- on which the regulatory authority of the Waterways Act is founded -- were relinquished when the parcel was registered in 1922 because those rights were not reflected in the registration certificate and because the Attorney General expressly waived any such rights in his answer filed in the 1922 registration proceedings. 1. History of the parcel. The basic history of Arno's parcel is undisputed. Before recounting it, we pause to define three terms that will be used frequently. [Note 2] First, "tidal flats" or "flats" refer to "the area between mean high water and mean low water (or 100 rods from mean high water, if lesser)." Opinions of the Justices, 383 Mass. 895 , 902 (1981). Second, "submerged lands" refers to "land lying seaward of flats." Id. at 903. Together, tidal flats and submerged lands -- all the land lying below the mean high water mark -- are referred to as "tidelands" generally. Opinion of the Justices, 383 Mass. 927 , 928 (1981) ("Tidelands are defined, speaking in general terms, as areas below primitive mean high tide"). Waterfront Dev. Corp. v. Commonwealth, 378 Mass. 629 , 631-639 (1979) (Boston Waterfront). However, because actual high and low water marks can change over time, notably pursuant to licenses to fill flats and submerged lands with soil, the starting point for determining the public's rights in tidelands (filled or unfilled) must be the historic, or "primitive," high and low water marks. See Opinions of the Justices, supra at 900-901.
seaward line of the parcel (the eastern-most edge of the filled road) continued to border on Nantucket Harbor, with the high and low water marks on that side being roughly equal due to the construction of a bulkhead along the road, protecting it from being inundated by the harbor. subject to the Commonwealth's regulatory authority over tidelands and the public trust. b. 1922 registration proceedings. The next relevant event occurred in 1921 and 1922 when two individuals petitioned to register the two lots that now constitute Arno's parcel. [Note 8] Both petitions were reviewed by an examiner of title, see G. L. c. 185, §§ 12, 24, who concluded that the petitioners lacked proper title and should not be allowed to register the lots. The examiner traced the lots back to the submerged "water lots" that existed before 1882 and noted that the owners of those lots had "no right to build structures [on the water lots] and fill in under the same, and thus gain title to the land under the building." The examiner concluded that there "has been no grant from the State of the land under tide water." [Note 9] In short, the examiner concluded that the Commonwealth was the true owner of Arno's parcel in 1922 because the parcel never had been conveyed to a private party. Rather, the parcel was licensed. assertion that the public had "certain rights" in them, the Attorney General stated that he had "no objection to the entry of the [registration] decree[s] . . . provided the same [are] made subject to any and all rights of the public." With regard to the land that the Attorney General viewed as unlawfully filled, he also asked that the registration decree not include a right to maintain the illegal bulkhead that bordered it. The Land Court issued original certificates of fee simple title to both lots in 1922. 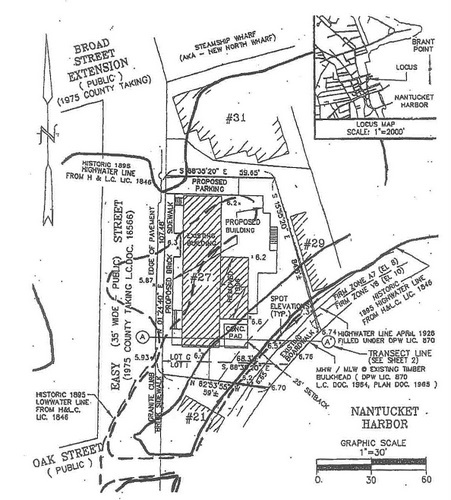 Both certificates set out the boundaries of the lots with precision, with the exception of the "Harbor line," i.e., the parts of the lots that bordered Nantucket Harbor, which were left undetermined for surveying reasons. [Note 11] The registration certificate included a caveat, making title subject to "any and all public rights legally existing in and over the same below mean high water mark." The parties refer to this as the "waterways encumbrance" because, despite their disagreement about whether the "mean high water mark" referred to the historic (pre-1882) or contemporary (1922) high water mark, they agree that it was the Attorney General's intent to reserve the public's public trust rights below the relevant water line. c. Arno's application for license pursuant to the Waterways Act. When Arno took title to the two lots in 1962, the transfer certificate memorializing his title included the same waterways encumbrance. dependent use" of the land. [Note 13] As a consequence, the department concluded that the project was required to comply with the Waterways Act and its accompanying regulations (waterways regulations) and approved the application with conditions drafted to ensure that it would. For instance, the department conditioned Arno's license on his maintaining and providing access to a boardwalk that currently runs along the harbor. d. Proceedings below. Arno, dissatisfied with the conditions attached to the license, pursued relief in two forums. First, in June, 2002, Arno requested an administrative adjudicatory hearing to challenge the license. See G. L. c. 91, § 18, eighth par. ; 310 Code Mass. Regs. § 9.17 (2008). Then, in August, 2002, Arno filed a complaint against the Commonwealth in the Land Court to challenge the power of the department to require a license in the first instance. Only the latter is the subject of this appeal. Arno's complaint in the Land Court sought declaratory judgment on three points: first, that Arno owned his parcel above the 1922 high water mark in fee simple free from any Commonwealth or public proprietary rights; second, that his parcel above the 1922 high water mark was not subject to an express or implied condition subsequent that it be used for a public purpose; and third, that G. L. c. 91 did not apply to his proposed construction because the project was to be located entirely above the 1922 high water mark. to transfer the Waterways Act issue to the Superior Court, where jurisdiction was more certain. G. L. c. 211B, § 9 (xxi). The transfer was approved, and the Land Court judge subsequently was designated to sit as a judge in the Superior Court for purposes of resolving the Waterways Act issue. (ii) 2004 Land Court portion. The focus of the proceedings in the Land Court was on the meaning of the certificate of title issued in connection with the registration of Arno's parcel in 1922. As noted above, in 1922, the title examiner recognized that Arno's parcel constituted filled tidelands to which title may never have been formally transferred from the Commonwealth to a private party. Accompanying the title examiner's reports were two maps, each of which indicated a high water line slightly landward of the bulkhead as it existed in 1922 (indicating that, absent the bulkhead, the high water mark would have been slightly higher), but significantly seaward of the historic high water mark (where the high water mark existed before the 1882 or the 1895 fills). In one map, the indicated high water mark is referred to as the "mean high water mark"; in the other, the line is not labeled. The Land Court judge focused on whether the Attorney General's attempt to reserve the public's rights, which was memorialized in the waterways encumbrance, was intended to be limited to the land below the 1922 high water mark, or whether his intention was to reserve the public's rights below the historic (pre-1882) high water mark, encompassing all of the filled areas -- essentially Arno's entire parcel. The judge also considered whether, regardless of the meaning of the waterways encumbrance, the public's rights in the parcel continued after registration in the form of a condition subsequent that the parcel be used for a public purpose, similar to the kind found to be in existence in Boston Waterfront, supra at 649.
summary judgment in December, 2004, and, on March 4, 2005, ordered his registration certificate to be amended to reflect that the Commonwealth and the public had no "proprietary ownership rights" landward of the 1922 high water mark. (iii) 2005 status conference. Four months later, during a July, 2005, status conference, the judge grappled with whether the order amending Arno's certificate of title was a final, appealable order. The judge concluded that the time to appeal from the Land Court order had run, noting that Arno's certificate of title already had been amended. The Commonwealth contended that the Land Court order was not a final judgment because the remaining portion of Arno's complaint, which had been transferred to the Superior Court, was still undecided. Thus, the Commonwealth argued that the Land Court order, while appealable on an interlocutory basis, could be appealed at the culmination of the Superior Court proceedings. The judge disagreed, and invited the Commonwealth to seek leave from a single justice of the Appeals Court to file a late appeal. [Note 16] The Commonwealth did not do so. Based on the absence of any propriety interest in the relevant portion of Arno's parcel, the judge concluded that the Commonwealth could not assert G. L. c. 91 jurisdiction under either the terms of the Waterways Act and the waterways regulations, or the public trust doctrine. Briefly, the judge concluded that the application of the Waterways Act to a parcel of land depends on the existence of a proprietary interest -- either an "easement of the public for [enumerated] purposes" or an "express or implied condition subsequent that [the parcel] be used for a public purpose" -- of the Commonwealth or the public in the parcel. See G. L. c. 91, § 1; 310 Code Mass. Regs. § 9.02 (1994). Absent an "easement" or a "condition subsequent" in favor of the Commonwealth or the public, no Waterways Act license could be required. from the 2005 and 2009 summary judgment decisions -- was consolidated in the Appeals Court. 2. Timeliness of appeal. As an initial matter, we must determine whether the Commonwealth's appeal from the 2004 decision was timely. Questions of law arising out of registration proceedings, such as the 2004 Land Court action, "may be appealed by any party aggrieved thereby." G. L. c. 185, § 15. Such appeals must be filed within sixty days when the Commonwealth is a party to the action. Mass. R. A. P. 4 (a), as amended, 430 Mass. 1603 (1999). Therefore, in ordinary circumstances, the Commonwealth would have been required to appeal from the judge's decision no later than sixty days after he ordered the registration certificate amended on March 4, 2005. The question is whether the Commonwealth was excused from this time limit because the rest of Arno's complaint remained unsettled. We conclude that the Commonwealth's appeal was timely. The purpose of an interdepartmental transfer is to "promote the speedy dispatch of judicial business." G. L. c. 211B, § 9 (xxi). Such transfers most frequently arise in one of two contexts, both of which are instructive in the present case. First, when a court of limited jurisdiction is confronted with a case over which its jurisdiction is doubtful or lacking, the court should not dismiss the case out of hand; rather, "the proper procedure is for the judge to ask the Chief Administrative Justice to transfer the case, or the judge, or both, to the appropriate department of the Trial Court." Konstantopoulos v. Whately, 384 Mass. 123 , 129 (1981). Thus, it would have been improper for the Land Court judge to dismiss for want of jurisdiction the portions of Arno's complaint that sought declaratory relief concerning the scope of the Commonwealth's regulatory authority under G. L. c. 91. Rules, Trial Court Rules at 1721 (LexisNexis 2008-2009), which implements the interdepartmental transfer power of the Chief Justice for Administration and Management, authorizes consolidation where proceedings in different departments of the Trial Court "involve the same parties . . . and the same attorneys" and where "the requested forms of relief are similar or related." Under this rubric, had Arno divided his case between the Land Court and the Superior Court, consolidation of the two cases would have been appropriate, with the result being that a single judge would have been empowered to adjudicate both parts of the case. Properly understood, at least analytically, the interdepartmental transfer of Arno's case operated as both a transfer and a consolidation. Thus, the Land Court sought a transfer of the portions of Arno's case over which it lacked jurisdiction, and then (simultaneously) sought consolidation of the transferred case with the one left behind in the Land Court. The fact that the judge of the Land Court was assigned to the Superior Court portion of the case supports this view -- the efficiency ends served by such assignment are those of having a single judge adjudicate a single controversy. It would not serve the purposes of interdepartmental transfer if, following a consolidation designed to achieve a comprehensive resolution of a controversy, the individual components of the consolidated case could spawn disjointed appeals. This is especially true where, as here, the resolution of the Superior Court issue -- the scope of the Commonwealth's Waterways Act authority -- depended on the resolution of the Land Court registration issue. 423 Mass. 1401 (1996). That was the judge's prerogative; it was not for him to require the Commonwealth to undertake it on the court's behalf. The Commonwealth's prerogative was to await final resolution of the entire case before taking an appeal from all or any part of it. 3. Intersection of public trust rights and land registration proceedings. Having concluded that the 2004 Land Court order concerning the meaning of the waterways encumbrance is properly before us, we turn now to review that order. The judge, focusing on the intention of the Attorney General to preserve the Commonwealth's objection to the placement of the harbor-side bulkhead, agreed with Arno that the waterways encumbrance applied only to the portion of his parcel that lay below the 1922 high water mark. Consequently, he reasoned that the waterways encumbrance included in the registration certificate was an encumbrance of limited geographic scope. The judge's analysis on this point is sound. We have little doubt that the Attorney General's concern was limited to the bulkhead issue. Certainly, the fact that both the Attorney General's answer and the resulting waterways encumbrance refer to "mean high water mark," a term that appears on one of the maps used in the proceedings to designate the 1922 high water mark, makes it impossible for us to conclude that the judge's interpretation of that phrase was clearly erroneous. was not necessary to include them in the registration certificates issued by the Land Court in 1922. Accordingly, in response to Arno's petition to clarify the meaning of his certificate of title, the judge should have concluded that Arno's title remains impressed with public rights. We explain each of these conclusions more fully below. a. The power to relinquish public rights in tidelands. The history of the law of Massachusetts tidelands is familiar, see Boston Waterfront, supra at 631- 639, and we will limit our discussion to its most relevant features. "Throughout history, the shores of the sea have been recognized as a special form of property of unusual value; and therefore subject to different legal rules from those which apply to inland property." Id. at 631. Since the Magna Carta, the land below the high water mark has been impressed with public rights designed to protect the free exercise of navigation, fishing, and fowling in tidal waters. See id. at 632. Thus, "[a]t common law, private ownership in coastal land extended only as far as mean high water line. Beyond that, ownership was in the Crown [and eventually the Massachusetts Bay Colony, followed by the Commonwealth] but subject to the rights of the public to use the coastal waters for fishing and navigation." Opinion of the Justices, 365 Mass. 681 , 684 (1974). In the 1640's, faced with an underdeveloped coastline and a need for wharves to promote commerce in the colonies, "the colonial authorities took the extraordinary step of extending private titles to encompass land as far as mean low water line," i.e., to include tidal flats. Id. at 685. However, "this ownership always had strings attached," Boston Waterfront, supra at 637, because the Colonial Ordinance of 1641-1647, which authorized the transfer of title to private individuals, "expressly specifie[d] that the public [was] to retain the rights of fishing, fowling and navigation" in the area between the high and low water marks, otherwise known as tidal flats. Opinion of the Justices, supra at 685.
rendered title in flats "qualified property," and meant that "even the proprietor of the flats can lawfully erect nothing upon them, which will obstruct or hinder such passage [of boats]." Boston Waterfront, supra at 636, quoting Commonwealth v. Charlestown, 1 Pick. 180 , 184 (1822). "Only the Legislature . . . [can] authorize interference with the right of public passage" over flats during high tide. Boston Waterfront, supra. The Legislature did authorize "interference with the right of public passage" by empowering private landowners to apply for licenses to fill their tidal flats. G. L. c. 91, § 14, inserted by St. 1872, c. 236, §§ 1, 2. See Trio Algarvio, Inc. v. Commissioner of the Dep't of Envtl. Protection, 440 Mass. 94 , 100 (2003). However, such licenses are -- and always have been -- revocable. G. L. c. 91, § 15, inserted by St. 1869, c. 432, § 1. See Boston Waterfront, supra at 640. While we have said that "the public interest in flats reclaimed pursuant to lawful authority may be extinguished . . . [by a] lawful filling," when the Legislature in 1869 required that all licenses be revocable, it did not "act to declare that [the public's] rights [are] extinguished" when a license is granted. Opinions of the Justices, supra at 902. Thus, although a licensed filling of tidal flats makes the public's limited rights therein impossible to exercise, they are not extinguished until the Legislature takes action to that effect. See Moot v. Department of Envtl. Protection, 448 Mass. 340 , 352 (2007), S.C., 456 Mass. 309 (2010) (Department of Environmental Protection not authorized to relinquish public rights). and, where there may be benefits to private parties, those private benefits must not be primary but merely incidental to the achievement of the public purpose." Id. These constraints on the Legislature's authority reflect its role not as an owner, but as a fiduciary for the public, as well as the fact that the land below the low water mark continued in its common-law state even after the passage of the Colonial Ordinance of 1641-1647.
b. Relinquishment of public rights by registration. An unstated presumption in the Land Court's decision in 2004 was that an act of registration could satisfy the relinquishment requirements set forth above. That presumption was incorrect. "If the [Land Court], after hearing, finds that the plaintiff has title proper for registration, a judgment of confirmation and registration shall be entered, which shall bind the land and quiet the title thereto, subject only to [certain exceptions]. It shall be conclusive upon and against all persons, including the commonwealth, whether mentioned by name in the complaint . . . . Such judgment shall not be opened . . . by any proceeding at law or in equity for reversing judgments or decrees . . ." (emphasis added). It is essential to recall what type of legislative action is required to relinquish the public's rights. In the case of submerged lands, the Legislature must satisfy the requirements set out in Opinions of the Justices, supra at 905, including that the legislation identify the land with specificity and be motivated by an adequate public purpose. Moreover, the private interests served by the relinquishment must be incidental, not primary. Id. Whatever public ends are served by quieting title to land, there is little doubt that the primary purpose in a particular registration proceeding is to serve the private ends of the party seeking registration. The process of divesting the public of its rights in tidal flats also requires an act of the Legislature. See Opinions of the Justices, supra at 902. See also Moot v. Department of Envtl. Protection, supra at 352. Where, as here, the only fillings that occurred (in 1882 and 1895) were performed pursuant to licenses that expressly reserved the Commonwealth's regulatory authority, the decree of the Land Court cannot be interpreted as a superseding "lawful authority"; the Land Court has not been delegated that power. § 45. However, public trust rights are different, see Boston Waterfront, supra at 649 ("the land in question is not . . . like ordinary private land held in fee simple absolute"), as evidenced by the rigorous limitations on the Commonwealth's ability to convey them. Opinions of the Justices, supra at 905. The powers of the executive branch with regard to the stewardship of public trust rights are derived from delegations by the Legislature. Moot v. Department of Envtl. Protection, supra (authority of Department of Environmental Protection). Thus, when the Attorney General appeared before the Land Court in 1922, he did so under specific constraints. He could not extinguish forever claims that he was not free to settle in the first place. We therefore are led to the conclusion that the 1922 registration proceedings could not have divested the public of its rights in Arno's parcel. Relinquishment cannot be achieved through registration where there has been no express delegation by the Legislature to do so. [Note 21]	c. Public trust rights do not need to be included in registration certificates. The limited scope of registration proceedings with regard to public rights is consistent with the terms of the Registration Act, at least insofar as those rights are "encapsulat[ed]" in a statute. See Fafard v. Conservation Comm'n of Barnstable, supra at 200 n.11. In most circumstances, an interested party who does not preserve his or her interest in land during a registration proceeding will lose the right to enforce that interest in the future. Deacy v. Berberian, 344 Mass. 321 , 328 (1962), quoting Tyler v. Judges of the Court of Registration, 175 Mass. 71 , 81 (1900). The finality of registration proceedings ensures that registered title is "certain and indefeasible." Deacy v. Berberian, supra. However, certain interests in land, enumerated in § 46 of the Registration Act, are exempted from this rule, including "claims or rights arising or existing under . . . the statutes of this commonwealth." d. Nature of title in Arno's parcel. We have thus far concluded that the public's rights in Arno's parcel were not extinguished despite the registration in fee simple of the parcel to Arno's predecessors in interest. We proceed now to consider the nature of Arno's title. relinquishment discussed supra. See Opinions of the Justices, 383 Mass. 895 , 902-906 (1981); Boston Waterfront, supra at 632-634. The jus privatum, in contrast, may be conveyed into private hands, as evidenced in the case of tidal flats by the Colonial Ordinances of 1641-1647. In the context of the Registration Act, the Commonwealth argues, registration that is binding on all interested persons, "including the commonwealth," G. L. c. 185, § 45, is limited to registration of the soil, or jus privatum, and not the public's rights therein, or jus publicum. Although we have not held that registration may divest the Commonwealth of its jus privatum title to tidelands, our foregoing discussion is sufficient for us to conclude that, at minimum, registration does not divest the public of its jus publicum rights. Thus, assuming that Arno has some title to the parcel, we must determine the nature of the surviving public interests. See Boston Waterfront, supra at 641 ("grants of what, and under what conditions?"). Title in tidelands is "in a special category, different from ordinary fee simple title to upland property." Id. at 644. The registration of title in tidelands "does not lead to the conclusion that [Arno] owns the soil at issue in unconditional fee simple title." Id. at 646. Rather, title in tidelands remains subject to public rights (unless properly extinguished). "We . . . hold . . . that [the petitioner's] title to the land . . . is subject to that same public trust on which the Commonwealth originally held it . . . . [I]t is impressed with a public trust, which gives the public's representatives an interest and responsibility in its development. This concept is difficult to describe in language in complete harmony with the language of the law ordinarily applied to privately owned property. We are not dealing with the allocation of property rights between private individuals when we are concerned with a public resource such as Boston Harbor. "We believe that the formulation adopted by the Appeals Court, appropriately expresses the intention underlying the grant made by the Lewis Wharf statutes, and we endorse it. We therefore hold that [the petitioner] has title to its property in fee simple, but subject to the condition subsequent that it be used for the public purpose for which it was granted." ("Notwithstanding [public rights in tidelands] and the use of such ambiguous terms as 'propriety' and 'liberty,' there is ample judicial authority to the effect that [owners of flats have] a fee in the seashore . . . subject to the public rights reserved"). hold that Arno possesses fee simple title in any historic tidal flats, subject to an "easement of the public." Finally, because the public's rights at issue here, in either form of tidelands, are enshrined in statutes of the Commonwealth, it is not necessary for them to be included in Arno's certificate of title. However, since this case arises from an action seeking to clarify the scope of the public's rights in Arno's parcel, G. L. c. 185, § 114, the public's rights, whether by "easement" or "condition subsequent," should be reflected in a new certificate of title. 5. Conclusion. The decision of the Land Court judge declaring that Arno has fee simple title subject to no proprietary interest of the Commonwealth or the public is vacated. The petition to clarify or amend Arno's certificate, pursuant to G. L. c. 185, §§ 114, 115, is remanded to the Land Court to determine the historic high and low water lines that may exist and that delineate the portions of Arno's parcel that he holds subject to a condition subsequent and those that he holds subject to an easement. The result of the remanded proceedings should be reflected in a new amended certificate of title. The decision of the Superior Court precluding application of the Waterways Act to Arno's parcel is vacated and we declare that Arno's parcel is subject to the Waterways Act, including its licensing requirements. [Note 1] We acknowledge the amicus briefs filed in this case by the Conservation Law Foundation and by the Real Estate Bar Association for Massachusetts in conjunction with the Abstract Club. [Note 2] These definitions are not meant to align precisely with those found in G. L. c. 91, § 1 (Waterways Act). Rather, they are culled from our jurisprudence. [Note 3] A map prepared by Arno during litigation, but not introduced in evidence at trial, is attached as an Appendix to this opinion. It illustrates the development of Arno's parcel beginning in 1882. [Note 4] We are unable to conclude with certainty from the record whether the entirety of Arno's parcel historically was submerged land. It is conceivable, based on a map from 1895, that some part of the parcel originally was tidal flats, that is land "between mean high water and mean low water." Opinions of the Justices, 383 Mass. 895 , 902 (1981). The parties agree that no portion of Arno's parcel was ever "upland," i.e., dry land to which the Commonwealth and the public possessed no special rights. See Opinion of the Justices, 365 Mass. 681 , 684 (1974); Houghton v. Johnson, 71 Mass. App. Ct. 825 , 828-829 (2008), quoting Storer v. Freeman, 6 Mass. 435 , 439 (1810). As a result of this uncertainty, occasionally we will be required to discuss Arno's parcel as though it historically consisted in part of tidal flats and in part of submerged lands. [Note 5] As indicated in note 4, supra, it is not entirely clear where the low water mark existed before the 1882 fill. It is clear that after the 1882 fill Arno's parcel was seaward of the post-1882 high water mark (that is, it lay inside the tidal basin created by the 1882 fill), as well as partially seaward of the post-1882 low water mark (that is, the portion of the tidal basin that remained submerged even at low tide). [Note 6] According to the map accompanying the license, the high and low water marks were almost identical at that point, both falling more or less along the bulkhead (first constructed in 1882) that prevented Nantucket Harbor from inundating the filled land. [Note 7] We do not suggest that the board of harbor and land commissioners had the power to divest the Commonwealth or the public of their rights in the parcel. See Moot v. Department of Envtl. Protection, 448 Mass. 340 , 352-353 (2007), S.C., 456 Mass. 309 (2010). In fact, licenses authorizing fill are required to be revocable and must be subject to Waterways Act conditions. See St. 1869, c. 432, § 1 (now codified at G. L. c. 91, § 15). [Note 8] The purpose of registration is to quiet the title in land, see G. L. c. 185, § 45, in order to ensure its marketability. See Morehardt v. Dearborn, 313 Mass. 40 , 47 (1943). [Note 9] These statements were made in reference to the petition to register one of the lots that is now part of Arno's parcel. In response to the petition to register the other lot, the examiner also discussed how the "Proprietary of Nantucket" had originally divided and granted the "water lots." The examiner concluded that "[i]t is doubtful whether the Proprietary had any claim to [the water lots], being below low water mark." By "Proprietary of Nantucket," the examiner was referring to the original governing body of the island. Soeder v. County Comm'rs of Nantucket County, 60 Mass. App. Ct. 780 , 783-784 n.2 (2004). The relevance of the Proprietary of Nantucket in this case is that, as noted by the title examiner, any of the Proprietary's rights in the tidelands of Nantucket would have been subject to the same public trust rights as any other tidelands. [Note 10] It appears from the record that at some point after the original bulkhead was built in 1882, a new bulkhead was erected farther seaward than the original bulkhead, i.e., further encroaching on Nantucket Harbor. There is no license authorizing this construction. However, in 1928, a license issued that authorized the filling of part of the parcel, as well as the construction of a new bulkhead. This license appears to have sanctioned the presence of the new bulkhead. Thus, in 1922, the Attorney General likely was objecting to the contemporary location of the bulkhead, which was seaward of the 1882 bulkhead and which was not yet sanctioned by the 1928 license. [Note 11] This lack of precision could also have been a consequence of the Attorney General's objection to the exact legal location of the bulkhead. [Note 12] The record does not reveal why Arno believed that a G. L. c. 91 license was necessary considering that his current position is that it was not. [Note 13] The terms "[p]rivate tidelands" and "Commonwealth tidelands" are terms of art defined in the Waterways Act. G. L. c. 91, § 1. Their application to Arno's parcel is discussed below. See note 23, infra. [Note 14] As discussed infra, the Land Court judge did not consider whether the Attorney General had the authority to limit the public's rights to the area below the 1922 high water mark. [Note 15] We disagree with the Land Court judge's interpretation of both the Registration Act and Boston Waterfront Dev. Corp. v. Commonwealth, 378 Mass. 629 (1979) (Boston Waterfront), a matter on which we expand, infra. However, it bears noting at this point that the Boston Waterfront case does not address whether the inclusion of the condition subsequent in the registration certificate was necessary for it to be enforceable under G. L. c. 185, § 46. The holding of the case -- that the petitioner had fee simple subject to a condition subsequent that the land be used for a public purpose -- said nothing about the need for the condition to be included in the certificate of title. Indeed, it is not clear that the court ordered the inclusion of the condition subsequent in the certificate of title. Rather, the court agreed with the decision of the Appeals Court that "the decision of the Land Court is to be modified to include our holding that the Lewis Wharf statutes granted a fee simple in [the land] subject to a condition subsequent that it be used in accordance with the purpose expressed in those statutes." Boston Waterfront Dev. Corp. v. Commonwealth, 6 Mass. App. Ct. 214 , 228 (1978). What the court achieved in Boston Waterfront, it seems to us, was a clarification that the decree of fee simple was to be understood as including a condition subsequent, not necessarily that the condition subsequent would have been waived were it not included in the certificate of title. [Note 16] The judge also noted that interpreting the order as final would permit Arno's administrative appeal to proceed, which in turn would permit the administrative law judge in the first instance to pass on the reach of the Waterways Act over Arno's parcel. It does not appear that the administrative law judge ever proceeded to do so. [Note 17] There is no explanation in the record for the four-year gap between the two summary judgment decisions. "Neither said Commonwealth nor the public hold any proprietary ownership rights in and to any portion of the land described in this certificate which lies landward of the water line of Nantucket Harbor, as it existed at the time of the entry by the Court of decrees of registration" in 1922. [Note 19] The judge did not confront this issue; the 2004 partial summary judgment decision, and the 2009 summary judgment decision that followed, were premised on an assumption that the acquiescence to the registration by the Attorney General in 1922 could have divested the public of its rights in the property. This premise is incorrect. "There is, of course, a public interest in resolving any uncertainty as to title to . . . tidelands. As we have said, the Legislature may properly declare that the Commonwealth has no continuing interest in lawfully filled flats. As to lawfully filled, submerged land, appropriate consideration must be given to the identity of the land, the nature of the Commonwealth's (and the public's) continuing interest, if any, in that land, and the use to which that land is or may be put." [Note 21] Any such delegation would be required to comply with the prerequisites articulated in Opinions of the Justices, supra at 902-906. Such compliance may not be possible. See Moot v. Department of Envtl. Protection, 448 Mass. 340 , 352-353 (2007) (authority to relinquish public's rights in tidelands "belongs to the Legislature alone. The rights of the public in Commonwealth tidelands . . . cannot be relinquished by departmental regulation, regardless of the fact that the department has proffered potentially worthy public policy rationales in this regard"). [Note 22] We recognize that the Waterways Act is not necessarily coextensive with the public trust doctrine. Fafard v. Conservation Comm'n of Barnstable, 432 Mass. 194 , 200 n.11 (2000). See Moot v. Department of Envtl. Protection, supra at 347 ("In enacting G. L. c. 91, the Legislature delegated at least some of [its public trust] authority to the department" [emphasis added]). Therefore, certain aspects of the Legislature's public trust authority may not be contained in the Waterways Act, and, indeed, may never have been recodified since finding "official expression" in the Body of Libertyes or early colonial statutes. See Boston Waterfront, supra at 634-635. However, we need not decide today whether those early sources qualify under the statutory exemption in § 46 of the Registration Act -- or whether a nonstatutory exemption for uncodified public trust rights must be implied -- because the present case concerns only the exercise of public rights through the mechanisms of a statute that clearly does qualify, the Waterways Act. [Note 23] The definitions of the Waterways Act in issue, namely "Commonwealth tidelands" and "[p]rivate tidelands," G. L. c. 91, § 1, make use of the terms "easement" and "condition subsequent." The definitions were adopted by the Legislature in 1983, St. 1983, c. 589, § 21, in response to the Boston Waterfront decision. See Trio Algarvio, Inc. v. Commissioner of the Dep't of Envtl. Protection, 440 Mass. 94 , 106-107 (2003). Therefore, the Legislature's use of the terms "easement" and "condition subsequent" should be understood as an incorporation of the Boston Waterfront decision into the Waterways Act. This intended case congruence between the Waterways Act and the Boston Waterfront case strengthens our conclusion in this case that the Waterways Act applies to Arno's parcel: the statute represents the Legislature's attempt to carry out its fiduciary duties under the public trust doctrine. That is, the existence of public rights in the parcel is compelling evidence that the Waterways Act applies.